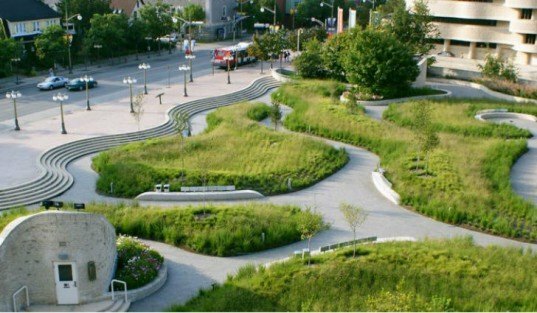 The plaza in front of the Canadian Museum of Civilization in Gatineau, Québec, Canada now celebrates the swaying grasses of the Canadian prairie. The museum was originally completed in 1989 and the plaza was meant to visually incorporate the museum buildings and the parliament buildings perched across the Ottawa River, but it was often vacant and unused. To rectify that, Claude Cormier + Associés inc. in collaboration with Aedifica designed and installed a new topography that recreates the nearby prairie, which is not only more beautiful, but also creates a micro-climate, increases biodiversity, lessens heat island effect, and improves air quality. The Canadian Museum of Civilization was designed by Canadian architect Douglas Cardinal and inaugurated in 1989. The museum consists of two pavilions whose volumes are physical representations of distinguishing geographical features in Canada. The public display wing is meant to replicate the dramatic effect of the glaciers, while the contours of the curatorial wing symbolize the majestic Canadian Shield. Finally, the open plaza in between was meant to simulate the vast Great Plains, but this wasn’t fully realized. The plaza lacked appeal and was left empty much of the year. To remedy this, the museum set out to renovate the plaza and bring to life the original concept, this time with real, living plants to recreate the Canadian prairie. Claude Cormier + Associés inc. in collaboration with Aedifica created topography by forming hillocks interspersed across the space with snaking pathways. Granite paving stones accentuate the little hills and the curves. The landscape renovation began in 2005 and was completed in 2010 and is now its own living prairie. The space is alive and more appealing and lures the public through their senses. The urban landscape also acts as a micro-climate, increases biodiversity, lessens heat island effect, and improves local air quality. The final result completes the original design and evokes this sweeping expanse in the Canadian landscape. + Claude Cormier + Associés inc. 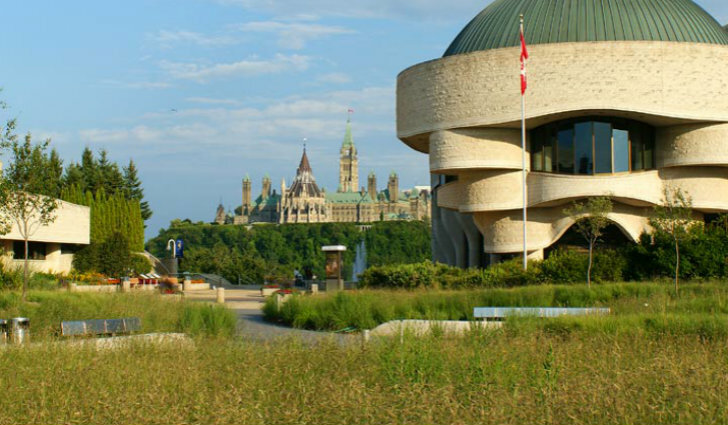 The Canadian Museum of Civilization was designed by Canadian architect Douglas Cardinal and inaugurated in 1989. The museum is comprised of two pavilions whose volumes are physical representations of distinguishing geographical features in Canada. The public display wing is meant to replicate the dramatic effect of the glaciers, while the contours of the curatorial wing symbolize the majestic Canadian Shield. Finally the open Plaza in between was meant to simulate the vast Great Plains, but this wasn't fully realized. The original plaza lacked appeal and was left empty much of the year. To remedy this, the museum set out to renovate the plaza and bring to life the original concept, this time with real, living plants to recreate the Canadian prairie. Claude Cormier + Associés inc. in collaboration with Aedifica created topography by forming hillocks interspersed across the space with snaking pathways. The plaza was inspired by the great plains in Canada. The landscape renovation began in 2005 and was completed in 2010 and is now its own living prairie. The space is alive and more appealing and lures the public through their senses. The urban landscape also acts as a microclimate, increases biodiversity, lessens heat island effect, and improves local air quality.